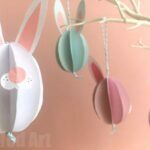 Spring and Easter are just a wonderful time to craft for – all those lovely spring time colours, yellows, pinks, greens and blue. Just lovely. 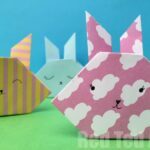 As our Paper Crafts love continue, we have another lovely Paper Easter Craft for you today! 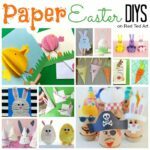 Learn how to make paper peeps bunny decorations! Yes. We have taken those yummy (?) 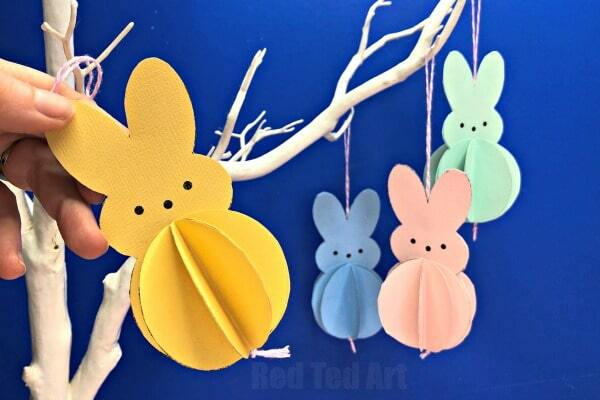 Peeps Bunnies as inspiration and turned them into 3d ornaments. 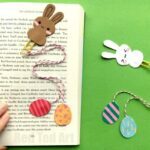 Learn how to make your own Peeps Bunny template or make use of our fantastic Peeps Decoration Lesson Plan and choice of printables! 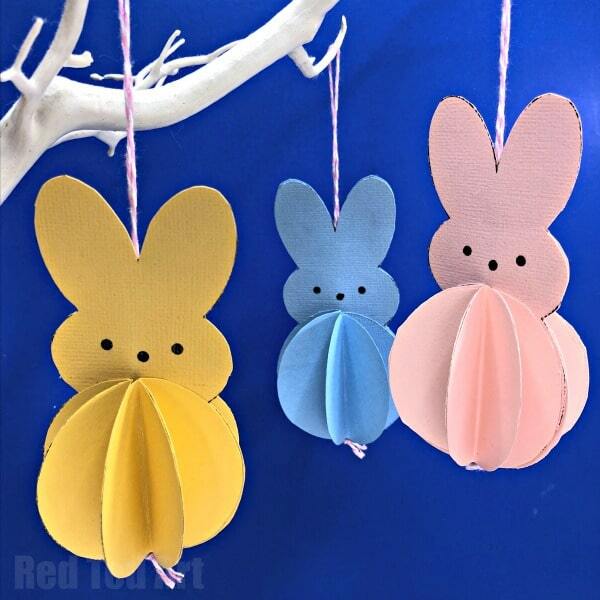 These little paper decorations would look amazing on any Easter Tree Decor or strung up as a Peeps Bunny Garland! Complete lesson plan, with printable step by step instructions (including photos!) 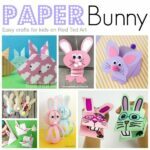 and 3 different types of printables (depending on how you much time you have in class and how you like to print) available on my Teachers Pay Teachers store. 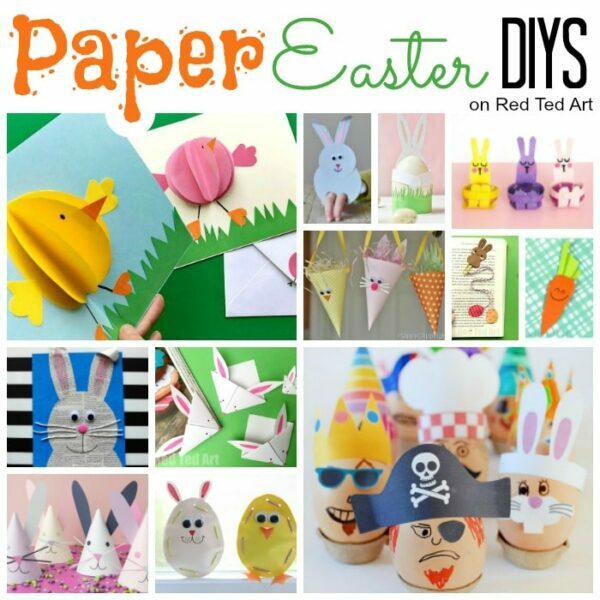 Note: if you need a printable version of these Step by Step instructions PLUS step by step photos, do head over to my Teachers Pay Teacher’s store for a handy download – including lesson plan overview, 1 page worksheet and 3 printable options. 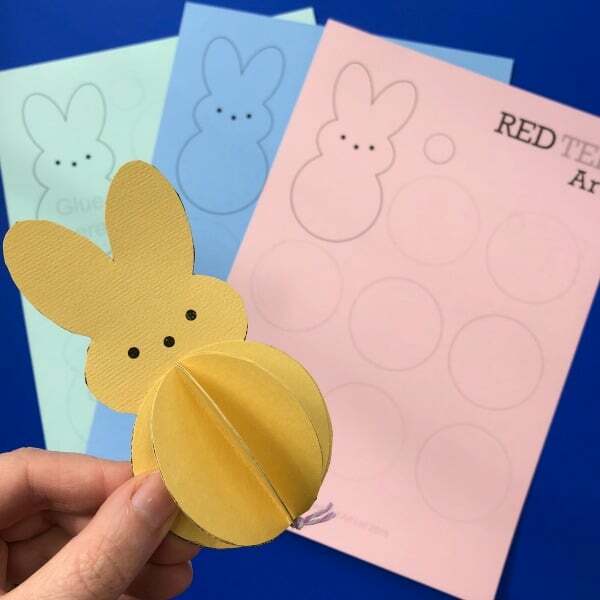 Either make your own Peeps Template or print your printable onto coloured paper (or use the cut & trace version if you perfer). Cut out all your Peeps shapes. You have a choice of a “double sided” Peep or one sided Peeps. The double sided version is better for hanging. 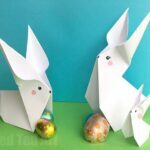 The cotten tail can be in the Peeps colour or cut from white scrap or omitted. Take a bit of yarn or baker’s twine, fold in half and knot. 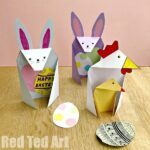 Glue between your two Peeps shapes. Fold your 8 coloured circles in half. Add glue to one half of one semi circle and stick a second one on top. Repeat until you have 4 of the circles stuck together. Put to one side. Now glue two more circles together. 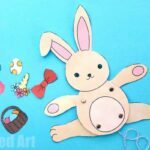 This time add the cotton tail circle before gluing on the third and fourth circle layers. 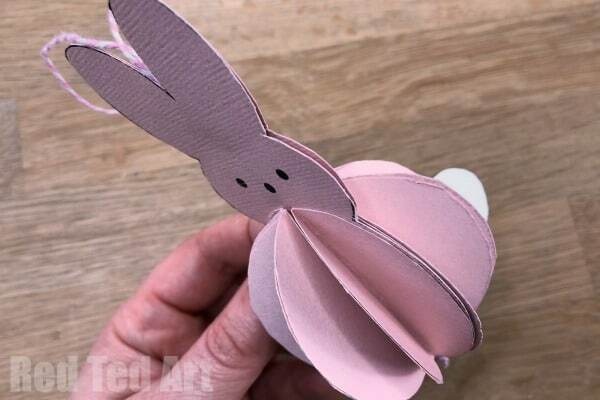 Add the third and fourth layers, until you have a 4 circle stack with the cotton tail inbetween. 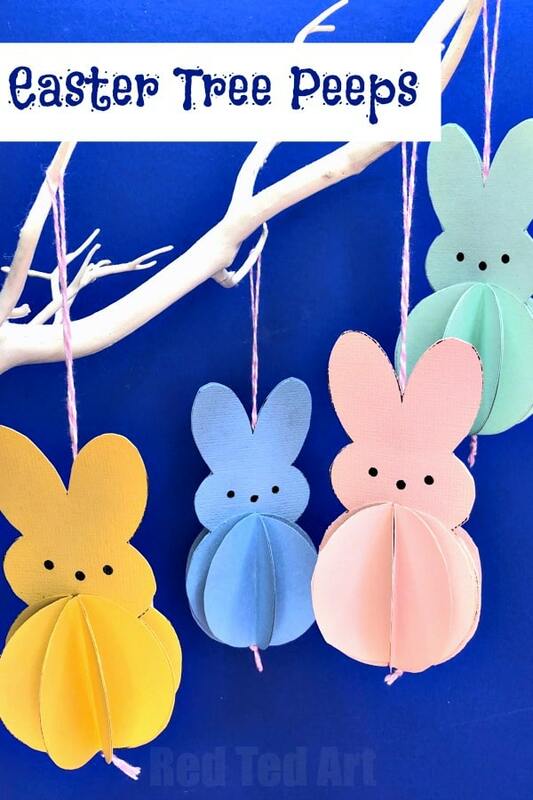 Add glue to the front of the Peeps “tummy” and glue your first four circles in place. Repeat with the back. Your Paper Peeps Ornament is now finished.